There is no denying Gabriel Voisin's creations were far from conventional, but a closer look at the remarkable vehicles will reveal that they are a unique combination of technical and artistic excellence. An aviation pioneer, Voisin transferred the lessons learned in aerodynamics and vehicle dynamics for his unusual designs. In the second half of the 1920s, influences from the Art Deco movement saw an evolution to squarer designs, but the relatively low height was typical for all Voisin automobiles. Another trademark feature was the use of the Knight-patented sleeve-valve engine. Voisin reached a peak in both his artistic and technical performance with the V12 engined C20 launched in the early 1930s. Up until 1930, the Voisin line-up consisted of very quiet, but not very powerful four and six cylinder engines. With the influx of more powerful competition from the likes of Hispano Suiza, Duesenberg and Rolls Royce, it was clearly time to enter the race for more power. Gabriel Voisin followed the path of the V12 sleeve valve engine, which was tried before in an experimental Voisin and more recently in the Daimler Double Six production car. With already a six cylinder engine available, it was a matter of constructing a new crankcase to accommodate the installation of two rows of cylinders. Displacing just under 4.9 litres, the new Voisin V12 produced 113 bhp, which was not a spectacular amount by any means, but the engine was very flexible with a large amount of the power available at around idle. At the 1929 Paris Motorshow the engine debuted in the C18 model. Code-named Diane, it featured a relatively straightforward chassis and body; not quite what was expected for the new Voisin top of the range model. Both the engine and coachwork of the one-off C18 have since been replaced, although a V12 has found its way back into the car's engine bay. A year later Voisin set things straight with the underslung C20 (Simoun), sporting a spectacular two-door cabriolet body, code-named Myrte. In the following years Voisin displayed the C20 with a variety of coachworks, but is uncertain wether these were new cars or one and the same with new coachwork. Voisin also delivered a V12 engine to Bucciali for one of their front wheel drive models. 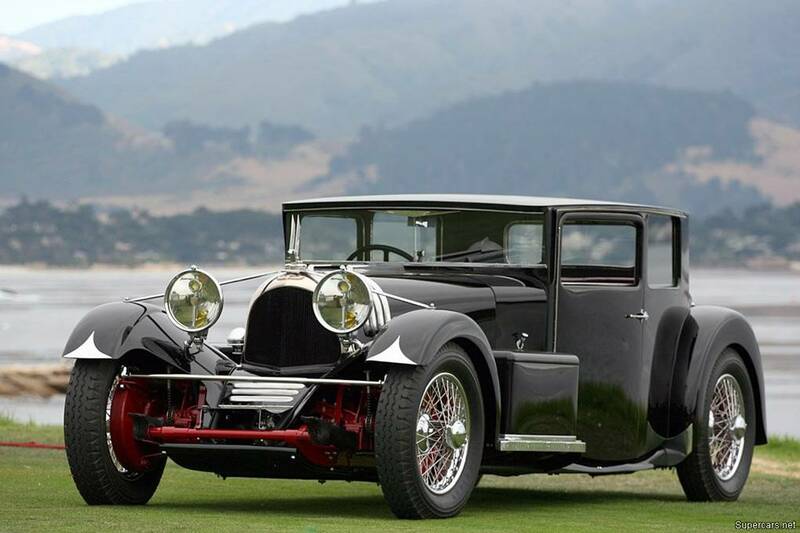 While the V12 Voisin is shrouded in mystery, it is clear that it never entered production and subsequent models again sported six cylinder engines. It is sad that Gabriel Voisin reached his creative peak at a moment when the rest of the world was busy coping with the global depression. Very few Voisins were constructed in these years and only a handful survive. There was also talk of the even more ambitious 5.8 litre engined C22 Scirocco model, but other than a few period photographs there has been no sign of the car in the last 70 years. Fortunately, at least one C20 has survived sporting a Demi-Berline style coachwork with the interesting code-name 'Mylord'. Historical photographs suggest that there could have at least two other variations on the C20 theme including the original Myrte Cabriolet and a Myra four-door Berline.